To his credit, Kremer hasn’t been content just to record and re-record the old warhorses, he’s done, for Teldec or Nonesuch, a number of original, off-the-beaten-track and, thus, interesting programs. Here, he pays tribute to his Latvian and, more generally, Baltic roots. 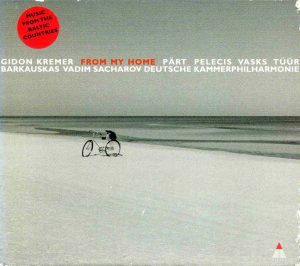 In a moving testimony that serves as liner notes, he writes that, traveling as much as he does and (when the disc was in preparation, in 1996) approaching the 50-year old signpost, when he reflects on “what is home?”, and even though he confesses to not speaking as fluently as he used to the Latvian language which he spoke as a kid, his answer is: the place were “I took my first steps – in life as in music”. So the disc offers a nice opportunity to hear works by composers that – except maybe for Arvo Pärt – aren’t exactly at the center of the 20th or 21st century musical map, although Erkki-Sven Tüur and Peteris Vasks have had – thanks in part to Kremer’s championship – quite some recorded exposure lately. That said, the music is mostly of the easy-listening kind, music for people afraid of “contemporary” music. Take Balys Dvarionas’ Elegy for Violin and String Orchestra, which opens the program. Okay, it was written in 1947 – incidentally, the year of Kremer’s birth, and two of the composers represented here, Georgs Pelēcis and Peteris Plakidis, were born the same year – but it sounds as if it had been written 50 years earlier or more, a mixture of Barber at his most lyrical (or even Glazunov, or Kreisler) and folk-music. I’m not saying that every composer from the mid-20th century needs to sound like Schoenberg or even Bartók, but this is really far-fetched back. The two short Grasshoper Dances of Plakidis (tracks 10 & 11) also sound like folk-music, or Bartók’s Violin duets – that’s the lighter side of Bartók. Vasks’ Musica Dolorosa for strings with solo cello is written somewhat in the Schnittke vein, not that it elaborates on forms drawn from baroque music, but it starts easy-listening, like an elegiac, brooding, mourning dirge that would make good film music if not very demanding contemporary music, but then skids into more agitated, torn and thorny expressive areas, before returning to the mood of the beginning (the music of Aaron Jay Kernis may also come to mind). Film music, and of the sentimental kind, that again is how Pelēcis’ “Nevertheless”, a double concerto for violin, piano and strings written in 1993 for Kremer and his pianist Vadim Sacharov, sounds in the course of its 28 minutes. Pretty, fluffy, sentimental, inconsequential. Kremer must like it, though, since he re-recorded it almost a decade later, with Katia Skanavi, with more works of Pelēcis, on Megadisc Classics, “Revelation”: see my review for longer comments on the piece. With the demise of serialism and of the faith in the “avant-garde” in the 1980s, a reactionary trend was given free rein in composition, heralded by composers like Pärt, Gorecki, Silvestrov, Taverner and many (if not all) of the repetitive minimalists. Well, sure, it’s sweet, easy listening (“so purrrdy”), wouldn’t frighten a baby (in fact could easily put baby to sleep), and there’s a public for that, the public that’s afraid of “contemporary” music – and I’m criticizing no one here, this is a free market. But those for whom the music of Xenakis holds some beauties, however demanding perceiving them may be, need to be warned that this CD is probably not for them. In fact, coming right after Dvarionas’ Elegy, and though it is not demanding listening, Pärt’s Fratres sounds like a great piece, hugely atmospheric and mysterious. Erkki-Sven Tüür’s Conversio for violin and piano (track 12) is slightly more demanding and, thus, interesting, it its syncopated and sometimes jagged rhythmic dynamism. Now here’s a composer who sounds like he is trying to retain at least some sort of balance between accessibility and exigency – but I’m afraid he’ll sound to many has having fallen on the dark side of the balance. After all, the music of Stravinsky, even his neo-classical style, still sounds difficult and un-melodic to most people. Likewise with Vytautas Barkauskas’ Partita for solo violin, in five short movements, written very much in a post-Bartók solo violin sonata-style – and that’s the tougher side of Bartók. 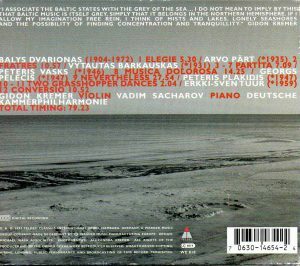 I happen to have another recording of Barkausas’ Partita, by Martynas Svegzda von Bekker on a program of solo violin pieces by contemporary Lithuanian composers recorded by the French label Dante LYS C004, recorded shortly after Kremer’s recital. Bekker is fine there, but his dryer sonics afford less comfortable hearing than Kremer’s, and Kremer is also the more imaginative fiddler in his renditions of the sonic effects of Barkauskas’ score. 80 minutes of music, no complaint on that front.